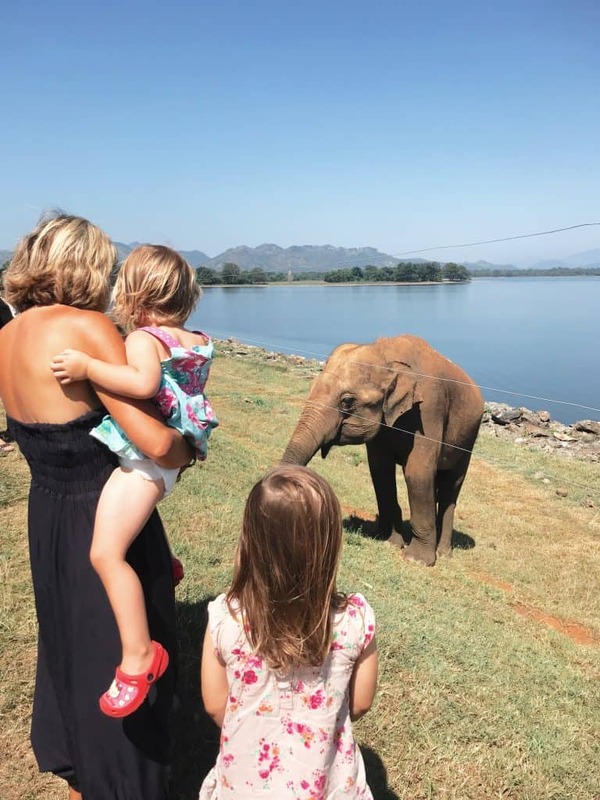 Our full time traveling family has found possibly our favourite place on this gorgeous island- Ella Sri Lanka, the mountain town in the interior hills. Ella is both a refuge from the buzz of Sri Lanka’s coastal resorts and a hub of activity; it is somewhere where you can retreat from the world or sightsee until you drop beneath the majesty of yet another glorious sunset. Be sure to check out our other Sri Lanka posts including how to see Blue Whales and swim with wild turtles on your Sri Lanka trip! The weather is considerably cooler than other parts of Sri Lanka; it heats up in the afternoon but we were all thankful for our hoodies in the mornings and it’s the first time since we arrived in Sri Lanka that we haven’t needed a fan! January to May are the best times to visit Ella in terms of weather, with warm but not boiling temperatures (late teens to early twenties C) and little if any rain (March is the driest month). April to December is rainy, with October being the wettest month. There are a few options for getting to Ella, depending on where you start your journey. 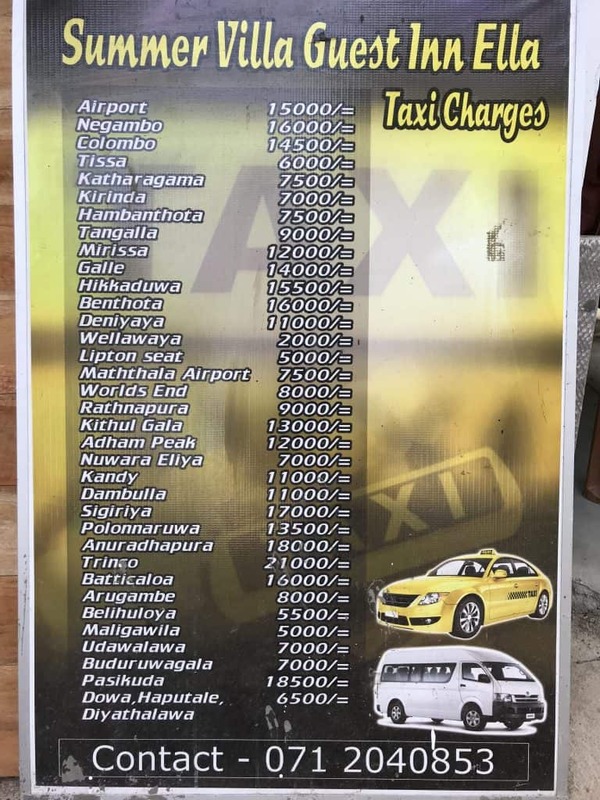 Wherever you are in Sri Lanka, taxis will be available to bring you. The roads to Ella wind through the hills and up mountains so if you get motion sickness load up on essential oils, bracelets, pills, whatever works. The drive is beautiful as you get closer to Ella and you will be able to take in the mountain forests and emerald tea plantations from the windows. We got a taxi from Udawalewe national park, where we did our first Sri Lanka safari, and it cost us 8000 LKR (£40) for the almost-three-hour drive in a seven-seater van, to give you a rough guide of how much to pay. If you are in Kandy (135km) then how to get to Ella is a no-brainer- take the world’s most scenic train ride through breathtaking tea plantations. It takes around 7 hours and costs £2 for a second-class ticket and £1 for a third-class ticket. If you get hungry look out for sweet local vendors selling fresh fruits and spicy snacks at stops along the way! If you don’t like trains you can get a bus from Kandy to Badulla or Bandarawela, which go through Ella. If you are in Hikkaduwa (230km), the Visit Ella website states that you can take an express bus Colombo-Kataragama and exit from Tissa or Hambantota. From Hambantota there are buses every two hours going to Nuwara Eliya which go via Ella. Alternatively take a bus to Matara and another bus from Matara to Bandarawela which goes through Ella. If you are in Yala national park (125km) (click here to see why we think Udawalewe is probably a better choice) get a taxi to Tissa and then from there get on a bus to Wellawaya and from there to Bandarwela, which goes through Ella. If you are in Nuwara Eliya (63km) hop on a bus to Hambantota which goes through Ella. Alternatively take a bus to Bandarwela and then change to get on a bus to Ella from there. 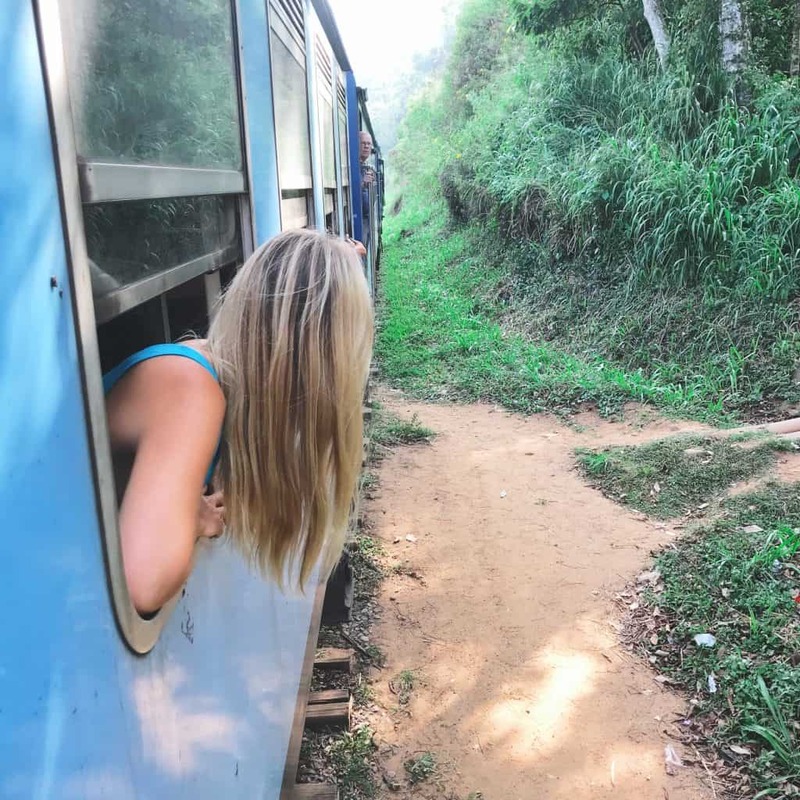 If you want to get the train to Ella starting in Nuwara Eliya you need to get a train to Nanu-Oya and then get a train from there to Badulla, which goes through Ella. 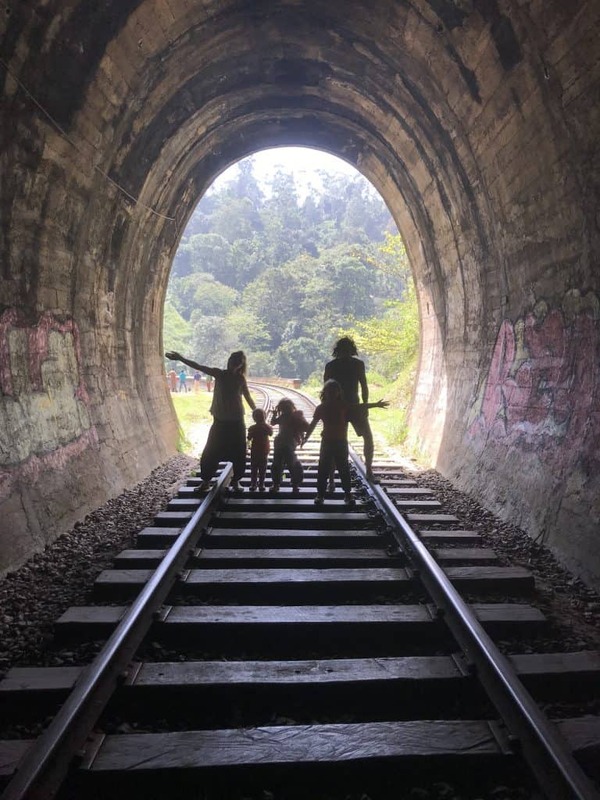 We took the beautiful train ride the other way, from Ella to Kandy- seven hours with a 7, 5 and 2 year old, with no problems at all. Little Adam’s Peak: This is the baby brother of the Adam’s Peak mountain and very do-able with kids. We took a tuk-tuk from Ella town to the start of the hills, near to the small local village made from corrugated-iron houses where many tea pickers live. The walk took us a couple of hours as we went slowly and our toddler decided to walk instead of being carried, which was pretty cool! The views are gorgeous and you will see tea-pickers working as you go, giving a glimpse into the traditional lives of the locals. After a winding path there are 300 steps to climb, followed by a steep scramble which may be harder for elderly people or those with tiny babies. Definitely bring a baby carrier as this last bit will require free hands to keep you balanced and safe if you decide to go right to the top, although the views just below the peak are very rewarding and worth the climb even if you don’t go to the ridge! Top tip: Bring some small cash notes for the kids selling fruit along the way, and also to give to one or two tea-pickers who pose for photos with tourists. 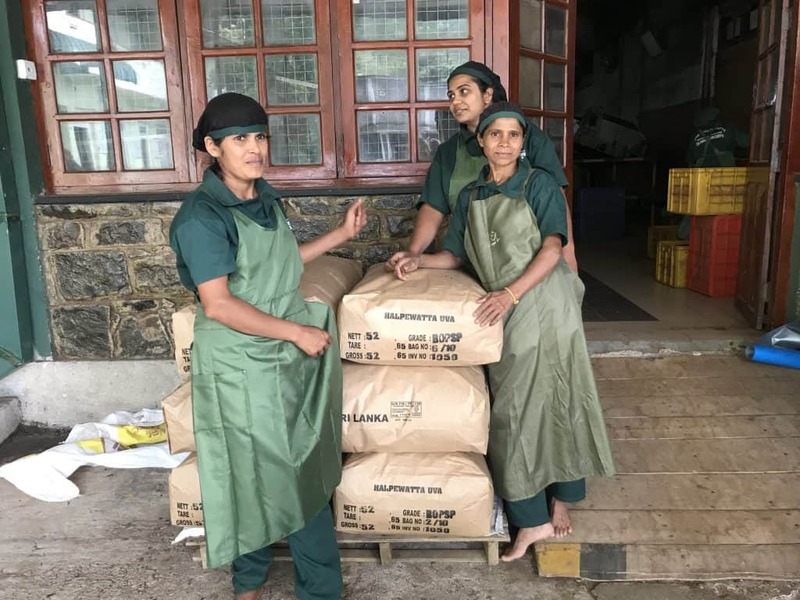 These women work 10 hour days in the blazing heat for less than £5 a day, so extra cash is sorely needed and goes a long way. 2. 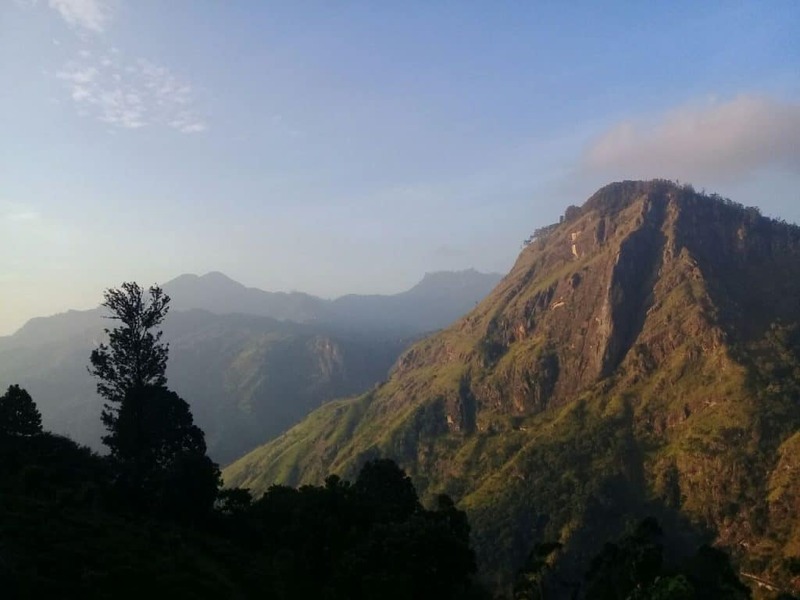 Ella Rock: Despite Mum and I having a fairly hideous experience on this route thanks to a group of feral dogs, the walk from Ella town to Ella Rock is a great way to get some exercise and take in some fab views of unspoilt Sri Lankan hills. Hikers walk along the railway line, through peaceful woods and out onto a hill ridge. 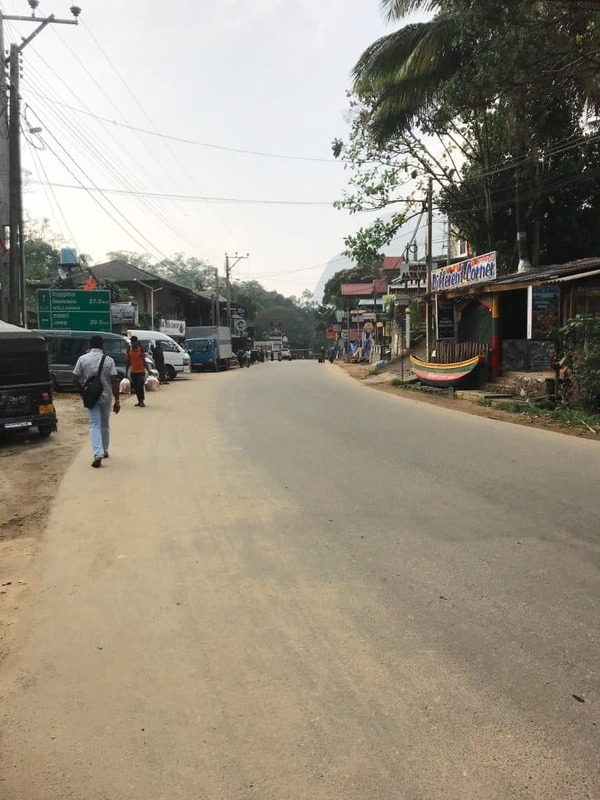 Everyone we spoke to who took this walk got lost so check out our post on the exact directions for the walk from Ella train station to Ella rock here! Top tip: DO NOT leave for the walk any later than 2pm. We found there were far fewer people on the track and we got into trouble with some dogs; combine this with the lack of sunlight from 5.30pm and you have a fine mess on your hands. Go early in the morning. 3. One of the best things to do in Ella is to visit a tea factory. We visited a tea and coffee plantation in Bali (see our post on our top 5 things to do in Bali here and our video of our plantation visit here) and it was great to see what happens after the tea is harvested. We had a tour of the factory, had a laugh with the workers (having kids is a great way to bridge cultures and connect with people while traveling) and sampled different teas at the end. Esmae chose a pack of fresh strawberry-flavoured tea as her Valentines Day present- super yummy! Top tip: Go in the morning as if the factory has finished processing all their tea for the day, you will miss the actual process. 4. Visit a waterfall. 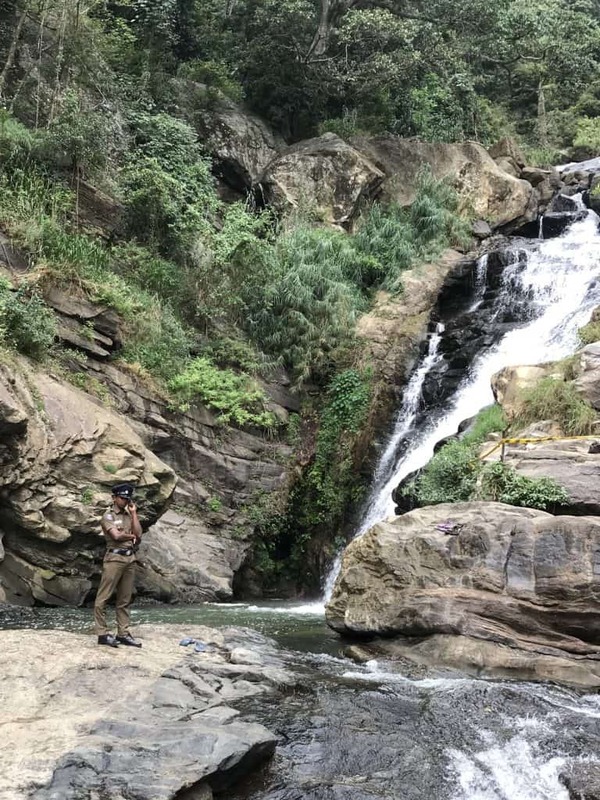 The most-visited waterfall in Ella, Ravana Falls, is nice, not spectacular, but it is worth visiting for an hour to have the experience and see the monkeys. We don’t pay to go places where monkeys are the main ‘attraction’; at this waterfall they have cottoned on to the fact that tourists like to buy coconuts and corn and mangoes, and they play at the side of the road waiting for scraps. Be careful though- we had a very hench, scarred monkey jump over Eira’s lap to nick a tourist’s lunch, so don’t picnic at the waterfall, and one tuk-tuk had to skid to a stop when a monkey lobbed a coconut into the road, so make sure you put your empty shells in the allocated bins or piles and not laying around for them to grab! Top tip: Ask your tuk-tuk driver to wait for you while you visit as you won’t need more than an hour and it saves having to haggle for a ride from the middle of the mountain! 5. 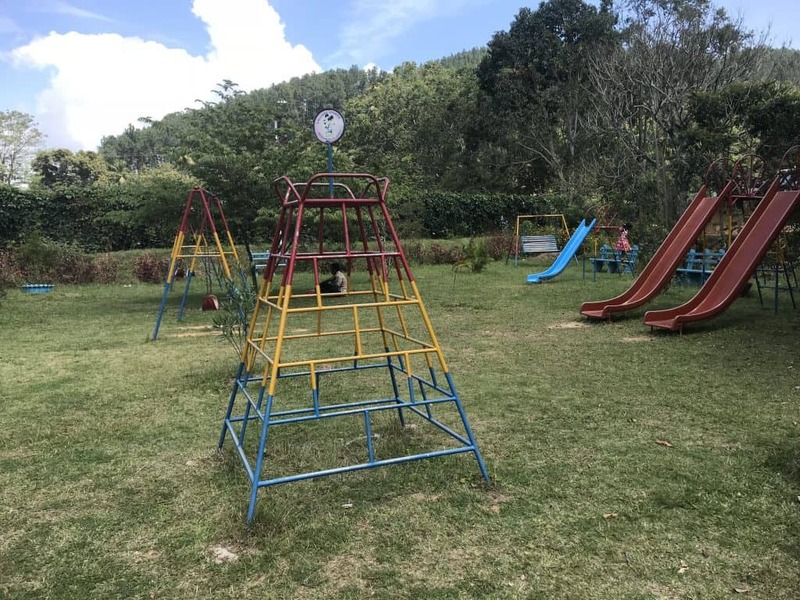 Children’s parks: When you run out of other things to do in Ella, Sri Lanka, there are two children’s parks which our kids really enjoyed. One is a very small playground next to the police station (ask any local and they will point you in the right direction, it’s a 2 minute walk from the main street) and the other is a large playground behind the ‘cricket pitch’ next to Ella train station. To get to this one look at the cricket pitch from the train station road and then walk straight across to the other side of the field, and it is behind some bushes. These are both free to use and nice in the late afternoon when the weather is cool for a run-around before dinner. Top tip: Health and safety in Sri Lanka is different to the UK- at the edge of the larger park there is a steep drop to the road so make sure your kids are aware. In the little park there is a small hut where kids like to play, but we found empty alcohol bottles so just check in there first to make sure there’s no broken glass. 6. 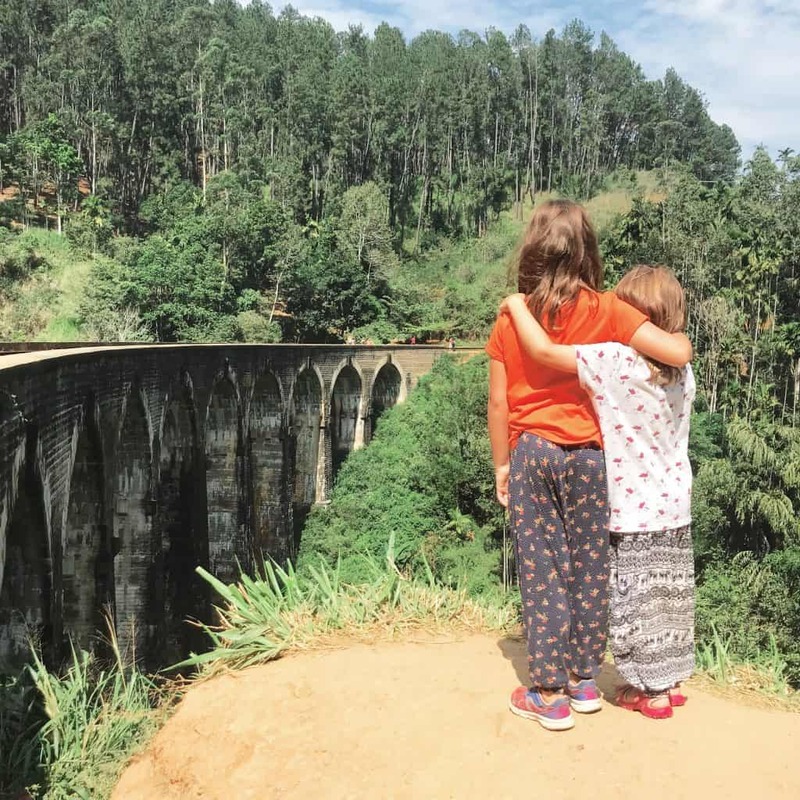 The Nine Arches Bridge is the iconic thing to do in Ella, Sri Lanka (20 minutes walk south along the train tracks from Ella station). This bridge has become famous through Instagram and YouTube, with its nine recognisable arches and tracks that you can walk on in between trains. There is a sweet little cafe shack next to it and a tunnel in which you can pose for silhouette photos, although of course we are far too cool for this. 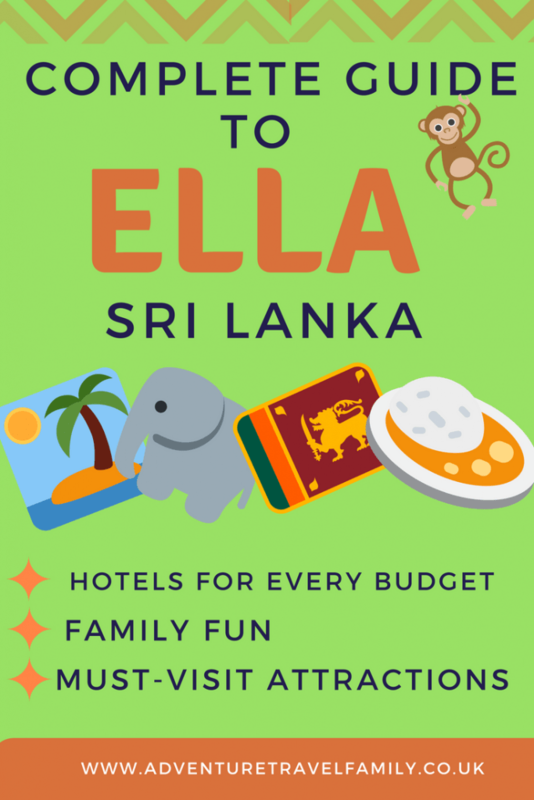 Whether you are on a £10/day budget or a luxury holiday, you’ll find something you like in Ella. There is one main road where most of the restaurants are; everything from western to traditional Sri Lankan fare is available. Rotis can be bought for around £1 or you can enjoy an English breakfast or avocado and quinoa in the Starbeans coffee shop. Top tip: Plenty of guesthouses will have a breakfast option and are cheaper than restaurants- if you can try a local breakfast of coconut roti with dhal, coconut samba and onion chutney I highly recommend it! There is a breakfast buffet for 750 LKR (just under £4) at the 360 restaurant (££) on the main street. We ate here every day for at least one meal as there was so much variety so all 6 of us found something each of us liked. The breakfast buffet includes hoppers and roti, a selection of fruit, yoghurt, bacon and sausages, toast, pancakes, waffles and unlimited tea and coffee (which was the dealbreaker for us!) They charged us one person for our 3 kids to eat too so it worked out at greta value, and the service is great. There is also a huge blackboard wall so kids can write on the walls with chalk. If you go here for dinner try the masala dosa- a huge rice pancake filled with spiced potato and served with three curry dips. Yum factor = Strong. Starbeans (££) cafe has good Wifi and a nice chilled vibe, and is the first coffee shop you come to on the left while walking down the main street. They serve granola bowls and avocado and quinoa with wholegrain toast. ‘Different Corner’ (£-££), the colourful little restaurant with a painted canoe outside on the main street, serves a fantastic vegetable curry and rice dish with 5-7 different curries (lentil, pumpkin, bean etc) and steamed rice. Don’t expect fast food but the wait is worth it and they are consistently rated Excellent on TripAdvisor. Art Cafe Umbrella (£-££) is a bright and funky art restaurant on the way to/from the Nine Arches Bridge and Little Adam’s Peak. There are some drawing supplies and games here to pass the time and the soups and fresh juices are highly recommended. The address is Passara Rd | 3rd Mile Post, Ella 90090, Sri Lanka. Chill cafe (£-££) is a pretty bamboo-style restaurant with plenty of western choices, from pizza to burgers and sandwiches. They also do a special curry with 10 different dishes wrapped in a banana leaf. Find this a couple of doors down from Starbeans. There is also a very sweet little tea shop next to the 360 restaurant where you can sample and purchase all different kinds of Sri Lankan tea straight from the hills. The small main street in Ella- don’t be fooled, there are a TON of restaurants! £6/night – Freedom Camp is a campsite for those adventurous souls who want to get close to nature. For £6 per night you’ll get a cosy futon bed inside a tarp-covered tent, with access to a hot shower and a campfire each evening. The owner is very friendly and will give insider info on what to see and the best ways to see it! Click here to see available dates. £12/night- Beauty Mount Tourist Inn is a quiet, clean hostel with spacious rooms in a great location, near to the the main strip of Ella but up some steps for a quieter atmosphere. There is a garden, shared lounge and luggage storage facilities. Beauty Mount Tourist Inn is highly commended for its friendly and flexible staff. Click here to see available dates. £15/night- Holiday Homes Guest Inn is 600m from the centre of Ella and has an on-site restaurant. Rooms are clean and have access to free WiFi as well as private bathrooms, a dining table, work desk and ironing facilities for those who like to look their best while scrambling through woods and tea plantations. Click here to see available dates. £15/night- Rustle Hill Home Stay has rooms with mountain views and free WiFi and is around 10 minutes’ walk from the centre of Ella. Rooms are cleaned daily and there is a sweet little outdoor restaurant where guests can enjoy breakfast and dinner. Click here to see available dates. £30/night- Raveena Guest House has incredible views of Ella’s hills and forests with extremely attentive staff. Rooms have complimentary toiletries and balconies and the outdoor dining area has hammocks to relax in. Raveena Guest House is just 1km from the Nine Arches Bridge and 1.5km from Little Adam’s Peak. Click here to see available dates. £35+/night- Ella’s Edge Resort provides spacious rooms with a desk, wardrobe and other conveniences as well as modern private bathrooms. There is a large balcony dining area with spectacular views and the extensive breakfast buffet offers traditional Sri Lankan food and drinks as well as western fare. Click here to see available dates. £50/night- Rock Side Inn offers amazing views from room balconies as well as a shared outdoor lounge area with hammocks for guests to relax in. The private bathrooms have complimentary toiletries and reviewers say that it is a great family-run place ideal for those traveling with small children. Click here to see available dates. £50/night- Ella River Front is a little walk from the main Ella strip and offers panoramic views, complimentary continental breakfast and large comfy beds. Guests can enjoy in-room tea and coffee making facilities and free WiFi. Click here to see available dates. £150/night- Zion View Ella is a gorgeous property on the hillside of Ella with incredible views and plenty of communal lounge areas to enjoy. There is a well-equipped shaded play area and sandpit for little ones and board games in the restaurant lobby. The complimentary WiFi is excellent and rooms have spacious balconies with furniture so guests can watch the sun go down. Click here to see available dates. £150/night- Ravana Heights offers huge rooms and suites and views of the famous Ella Rock and surrounding mountains. The staff are exceptional and have plenty of stories to tell about the local area and advice on how to make the most of your stay. Sri Lankan, Thai and international cuisine is available in the restaurant. Click here to see available dates. £450/night- 98 Acres Resort & Spa is the resort that we drooled over from the other side of the hill. It has the only swimming pools in Ella (infinity pools overlooking the emerald-green hills) and each room is more like an apartment, with seating and dining areas, kitchenettes and luxurious bathrooms with complimentary toiletries. There is a gym on-site and dinner can be served in the restaurant or on your private balcony or terrace. Click here to see available dates. We recommend ordering the Lonely Planet Guide to Sri Lanka before you visit. 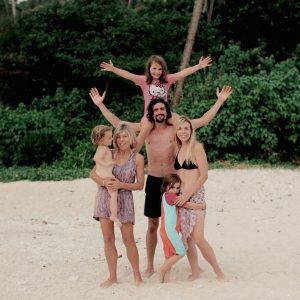 Over the last two months our full time traveling family has completed a loop of the bottom half of Sri Lanka, visiting Negombo, Colombo, Unawatuna, Galle, Mirissa, Tangalle, Udawalewe national park, Ella and Kandy. We blogged our first impressions of Sri Lanka, swam with sea turtles, found out why we shouldn’t visit the hatcheries and had epic meltdowns. Before that we visited Bali and Thailand on our travel adventures- follow us on Instagram, Facebook and YouTube to see what we’re up to and follow the best and worst of our nomadic lifestyle! This post contains affiliate links; using them makes us a small commission to keep this site going at no cost to you. We are considering a trip in late April ie 13th-28th this year to tie in with school vacations (we are a family with 3 kids aged 15,14 and 4). My concern / question is whether end of April makes sense from a weather viewpoint as I read this is the start of monsoon – and the flipover period between the coastal East beaches and SW? So if we did a “once in a lifetime” type trip – does April make any sense? I know you are not a weather expert and it can change – but Id appreciate any insight into travel this time of year. Also we would arrive around New Year,,,,does this pose any impacts eg will places be super busy for the first few days? ?